A group of astronauts are sent out on a seemingly routine space expedition until mayhem ensues. Mission control warns the space crew that a Russian missile strike has just destroyed a satellite causing a chain reaction of debris to head in their direction. Before they can evacuate, the debris destroys their space ship, leaving only Dr. Ryan Stone and Matt Kowalski as the sole survivors. Alfonso Cuaron returns to mainstream film making with this groundbreaking Sci-Fi thriller, avoiding fantastical space adventures and bringing us a terrifying film about the true dangers of space. As far as how factual the film is, it must be the most realistic space film we have had in a long time as we are captivated by zero-gravity and breathtaking imagery. Gravity finally brings us a film where there is no noise in space, and surprisingly it’s a hell of a lot more scarier than having your ears ravaged by loud explosions. Not having that ability of anticipating danger around you and losing that sense makes you more vulnerable than you would think. Seeing that on screen really gets your heart pumping. 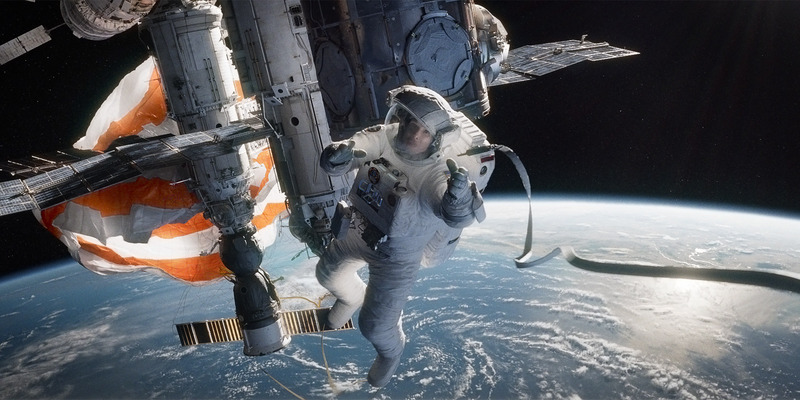 Gravity has really pushed the bar for technology in film, that alone has made the film what it is, a special effects triumph. The attention to detail is commendable and would make any real life astronaut less prone to ripping their eyes out during viewing. I don’t know how they did it but I want to know very badly as you get a real sense of that zero gravity and how frustrating it would be floating around up there; cool at first but when disaster strikes, it’s less than ideal. Ultimately that’s what makes Gravity so riveting, it’s realism makes space expedition scary even if the possibilities of the events depicted are very low and that’s why we can’t take our eyes off the screen. Beneath the engaging visuals and thrilling action sequences is quite an emotional narrative. The film explores the themes of getting through a series of bad situations and the rebirth of our protagonist Dr. Ryan Stone. With the constant orbit of debris, disaster will strike multiple times if you happen to be in the line of fire. Throughout the film we’re wondering if Stone will make it or even have the desire to carry on as we learn of her hardships on earth. There is an important scene where we see Dr. Ryan Stone curled up resembling a fetus in a womb, there on we’re given the impression that there’s an emotional growth to come. As for performances they were brilliant with added emphasis on Sandra Bullock. Thinking about it, these role’s must be what most actors dream about. Firstly it’s a freaking space film, secondly it’s totally groundbreaking and thirdly you get to wear a space suit. By landing this role Bullock has really shown us what she’s made of, steering away from comedies and doing something a lot more thrilling. I hope she continues making films like this. Gravity will definitely be getting some awards during award season and rightfully so as this is probably the best film I’ve seen all year. I’m a total sucker for a good thriller with awesome special effects. If you’re into sweating involuntarily throughout a film then Gravity is for you. This entry was posted in Roze-Reviews and tagged 2013, Adversity, Alfonso Cuaron, Best Film 2013, Critic, Disaster, Expedition, Explorer, Film, Film Review, George Clooney, Gravity, Movie, Movie Review, Rant, Rating, Rebirth, Sandra Bullock, Sci-Fi, Sci-Fi Thriller, Science Fiction, Space, Space Walk, Thriller by rozeminho. Bookmark the permalink.